PERSIAN GULF (May 14, 2008) The amphibious assault ship USS Nassau (LHA 4) leads a formation of the coalition ships including the guided missile cruiser USS Philippine Sea (CG 58 ), the Bahraini Navy frigate RBNS Al Manama (FPBGH 50), the Royal New Zealand Navy frigate HMNZS Te Mana (F 111), and the United Arab Emirates Navy missile boat UAENS Mubarraz (P4401) during Exercise Goalkeeper III in the Persian Gulf. The multi-lateral Goalkeeper III exercise includes participation from Bahrain, New Zealand, United Arab Emirates, Qatar, Great Britain and the U.S. The exercise is designed to train forces in various aspects of maritime security operations as well as command and control functions with the Royal Bahraini naval staff. MSO help develop security in the maritime environment, which promotes stability and global prosperity. 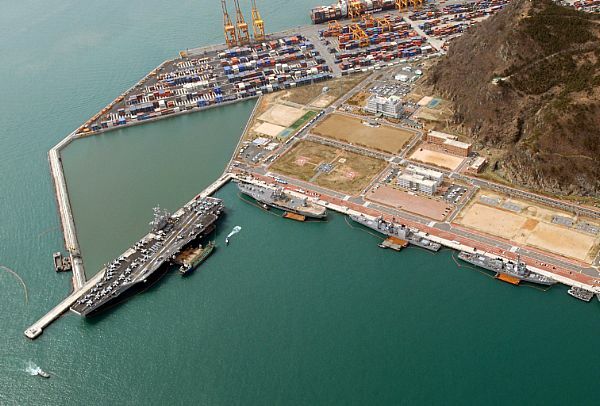 These operations complement the counterterrorism and security efforts of regional nations and seek to disrupt violent extremists' use of the maritime environment as a venue for attack or to transport personnel, weapons or other material. PACIFIC OCEAN (Nov. 19, 2008) U.S. Navy and Japan Maritime Self-Defense Force ships steam in a 20-ship formation surrounding the aircraft carrier USS George Washington (CVN 73) as U.S. Navy, U.S. Air Force and Japan Air Self-Defense Force aircraft fly overhead at the culmination of ANNUALEX 2008. 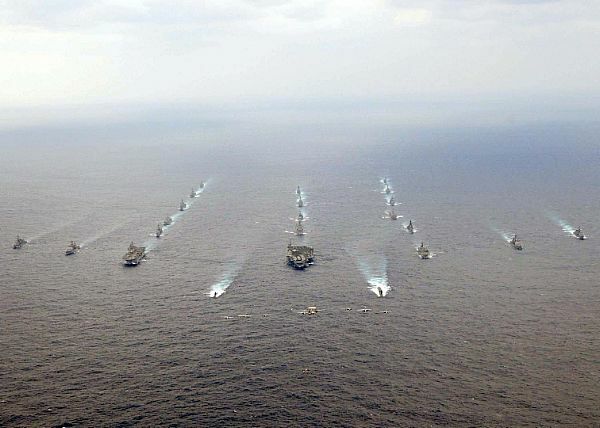 ANNUALEX is a bilateral exercise between the U.S. Navy and the Japanese Maritime Self-Defense Force. BUSAN, Republic of Korea (March 12, 2009) Ships from the John C. Stennis Carrier Strike Group and U.S. 7th Fleet flagship USS Blue Ridge (LCC 19) are moored pier side at the Republic of Korea Navy Base Oryuk-Do in Busan. The strike group arrived March 11, while Blue Ridge pulled in March 5. 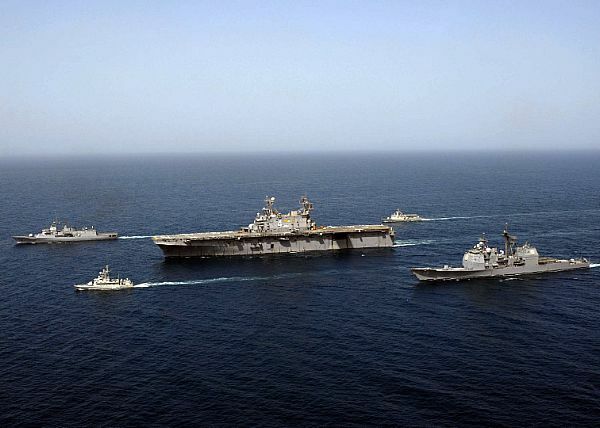 Pictured from left are the aircraft carrier USS John C. Stennis (CVN 74), the amphibious command ship USS Blue Ridge, the guided-missile cruiser USS Antietam (CG 54) and the guided-missile destroyer USS Preble (DDG 88 ).